Is there a more confused (or confusing) subject than creating a personal vision statement? Okay, leadership is about "vision", and obviously there's nothing wrong about creating a vision for your life and your business. Is it really all about mindset? Really? Some of the mindset "gurus" would have you believe that the simple act of writing your personal vision down is almost as good as making it happen. So how do we create a vision statement that works? One that takes reality into account, and puts us into action mode, while holding us accountable for producing results? Aren't results the object of any plan of action? Where do we start? At the beginning of course; with the brutal facts. To make better decisions and to avoid making the same mistakes over and over we must get real with ourselves and assess the reality of our lives and businesses. As Robert Greene writes in his book The 48 Laws of power: "You begin by examining the mistakes you made in the past, the ones that most grievously held you back." Clear thinking about your vision for the future is rooted in your ability to think clearly about the past. But at the heart of many books and training courses identifies the "dream" itself as the key to making it come true. That's B.S! Most visions for the future focus on the end results, but forget the necessary steps that must be taken to achieve it. A good vision statement never forgets the barriers to success and gives ideas on how to mitigate them. These barriers actually benefit you, because they keep you honest and focused on the task at hand. The key to making your vision a reality is constant small improvements (like the Japanese idea of Kaizen), improvements not only to yourself but improvements to your vision statement as well. Have You Spied the #1 Enemy To A Powerful Vision? It is a silent killer to thousands of could-be visions, do you know what it is? Too many choices kills your vision. . . If there is one serious danger lurking in the future in the back of people's minds who dream of achieving great things both professionally and personally, it is not a lack of choices, it is too many choices. What you can be best in the world at? For you, understanding these three factors at a core level, and being able to visualize the shared space in the middle Collins calls "The Hedgehog Concept". The best businesses confront the brutal facts through disciplined thought, then they root their personal vision statement on the amalgamation of these factors. This process takes disciplined thought, something you might feel you lack. At first everyone feels this type of resistance, but you must identify this: Resistance. "Resistance presents us with a series of plausible, rational justifications for why we shouldn't do our work," says Steven Pressfield. Once you have the three factors in place making decisions about your personal vision statement becomes 100% simpler. It makes the answers self-evident because if they don't fit into your "Hedgehog Concept" they don't belong. Many books and trainings ask you to write a personal vision statement; they encourage you to do so with flowery language and possession of the always elusive "positive attitude." Why? Because flowery language and attitude sells easier than reality. To improve your results you must develop the skills that produce better results. Success produced any other way is pure dumb luck. I'm not suggesting a positive attitude is worthless, far from it. Positively helps you stay focused and accountable on your vision and goals. Stay positive while in possession of a clear sense of reality. Understanding your position in the world helps you make rational good decisions. Which means avoiding delusions at all costs. For many people living their life under an illusion this process can be painful, and many people avoid pain (even when it's good for you). In the short term, avoiding pain causes long term destruction. Those brave souls who develop their personal vision statement without the possession of a clear sense of reality, will find more obstacles then ways to mitigate them. The better understanding you have of your position, the better grounded you'll be and the better results you'll attain in the future. 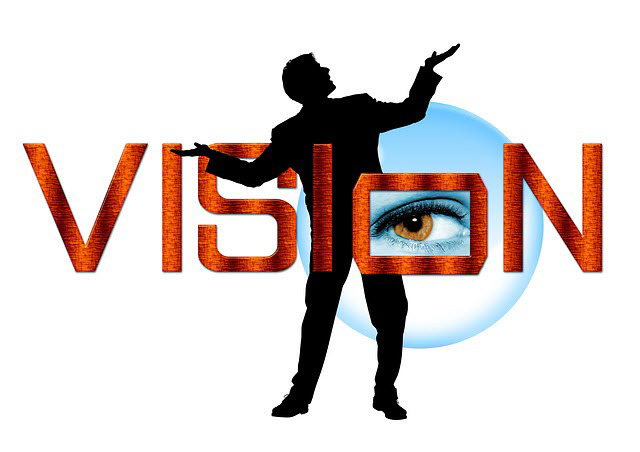 Setting goals with your personal vision statement.